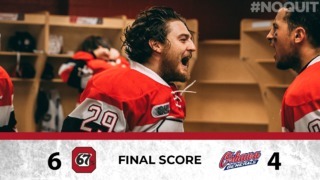 On a night where the Ottawa 67’s were honouring one of their-best known former goalies, it was only fitting that the club’s current netminder would shine in a 6-2 Ottawa win over the Mississauga Steelheads. After former NHLer and 67’s alum Darren Pang took part in the ceremonial face-off as one of the top 50 players in club history, Olivier Tremblay took over from there, stopping 34 shots to lead his team to a key win. With their goalie on his game, the offence came alive as captain Travis Barron led the way with a hat trick and an assist. The victory puts Ottawa in seventh in the Eastern Conference, one up on Peterborough, and widens the gap with ninth-place Mississauga to four points. It was a back and forth game all night until the third, with Ottawa opening the scoring courtesy of Barron’s 10th of the year as the captain tapped in a nice pass from Carter Robertson on the power play. The teams would trade goals in the second as Nicolas Hague tied it up for Mississauga before Sasha Chmelevski scored his first of two on the night to give Ottawa back the lead. Owen Tippet would again even things up early in the third only to have Chmelevski restore Ottawa’s lead two minutes later. Barron added his second of the game with Ottawa shorthanded midway through the third. Austen Keating, with his 16th, scored into an empty net and Barron added his third with 19 seconds to go. 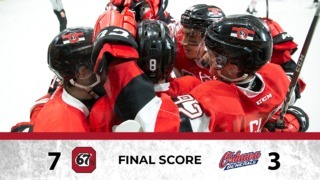 The 67’s continue their lengthy homestand this weekend with games against the Hamilton Bulldogs on Saturday and Peterborough Petes on Sunday. 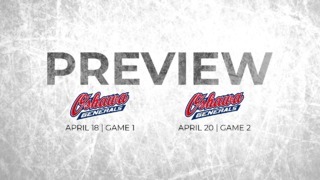 Both games start at 2 p.m. at The Arena at TD Place. On the team raising their compete level … “I liked everything about our game. I liked the compete level and the fight we had. We made a few adjustments in our game after the second period and the guys responded extremely well, so I’m really proud of them. On the level of competition against Mississauga …”They have really high-end players. If you let them get going, they’re extremely dangerous. We were a little bit nervous at the start but we scored a big goal on the powerplay to give us confidence. Former NHL goalie Darren Pang, who was honoured Wednesday as one of the top 50 players ever to suit up for the Ottawa 67’s, played 90 games for the Barber Poles in the mid-1980s. 67’s winger Austen Keating played his 160th career OHL game on Wednesday night. Merrick Rippon has five points in six games for the 67’s since being dealt to Ottawa from Mississauga. The game marked the first time since former 67’s centre Matt Foget has played in Ottawa since being traded to the Steelheads. Foget has had a strong debut with his new team with two goals and eight points in five games. In addition to leading the way with three goals and an assist, Travis Barron also led both teams in shots with six on the night.